More than ever, it is possible to obtain Health Spa treatments for your own home. Increasingly, advanced technology offers homeowners more compact versions of the popular steam rooms and saunas found in fitness complexes and spas across the globe. A new innovation now available is the infrared sauna which aims to offer an alternative to the traditional ’hot stove’ saunas. Doing away with the process of pouring water over hot stones, the infrared sauna uses carbon boards or infrared tubes to emit infrared heat throughout the unit. 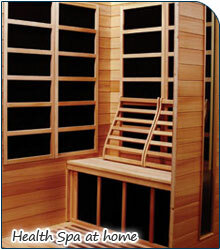 Unlike the traditional models, infrared sauna heat penetrates deeper through the skin to body tissue. This all sounds very well but how safe are these Infrared Saunas? Does infrared heat impact negatively on the body? It may indeed seem ominous but in fact infrared is a safe form of energy. This type of sauna has been embraced by many health professionals as a possible means of reducing symptoms of various health problems. Furthermore, the United States Department of Health and Human Services, deem that this form of energy is safe for humans. Infrared is part of the electromagnetic spectrum lying between microwave and visible light. It is the heat used in incubators to warm premature babies, used by plants for photosynthesis and growth and not to mention infrared light is what is used by remote controls to turn on the TV. Infrared is not to be confused with the harmful ultraviolet rays (UV), also on the electromagnetic spectrum. These are used by sunbeds whose use are consistently discouraged by global governing health bodies due to the strong link between UV ray exposure and skin cancer. Encouraging research from universities and hospitals worldwide has shown that infrared saunas may indeed have substantial benefits for individuals suffering from all manner of diseases and illnesses. Recent findings from the Kagoshima University in Japan have shown that patients with Chronic Heart Failure (CHF) who were treated with these saunas benefited from increased cardiac function. The treatment was deemed both ‘safe and promising’. Considering that annually, CHF affects more people than cancer, this is indeed a propitious development for future treatments. 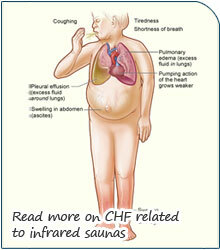 Similarly, the infrared sauna was used in a study of patients suffering from Rheumatoid Arthritis. The Saxon University of Applied Sciences found that infrared saunas exhibited short-term post-treatment benefits and did not antagonise the disease in any way. Additionally, Dr. Sherry Rogers’ (M.D) book ’Detoxify or Die’, enthuses that the Infrared Saunas are one of the most effective means of expelling built up toxins within the body. She further claims that it is could be an alternative way of treating several diseases without medication. Although research continues into the benefits of infrared saunas, the initial findings are very promising. In general, saunas are renowned for being beneficial to health, increasing circulation through the body’s absorption of heat and aiding the vital organs in their functioning. Therefore, recent research substantiates the view that Infrared saunas are certainly safe for human use and in addition may greatly benefit the quality of your health through regular use. Dr. S. Rogers (December 2002), ‘ Detoxify or Die’.